The Fellowes Neutron Plus Rotary Paper trimmer is designed for personal and home use and can cut up to 10 sheets of 20lb paper at a time. However unlike the Fellowes Neutron which only offers one cutting blade, the Fellowes Neutron Plus offers 3 additional cutting blade styles. Choose the traditional round cutting blade, or a wave cut, perforating blade or a score/fold blade. This 12 inch rotary cutter uses Fellowes patented SafeCut blade cartridges to help keep users safe by preventing contact with the cutting blade. Plus, it offers a quick change blade system that helps to ensure fast, easy blade cartridge removal or insertion. The base for the Fellowes Neutron Plus trimmer includes an integrated SafeCut cartridge storage compartment for the different styles of cutting blades so that you don't need to worry about misplacing them. The Fellowes Neutron Plus even includes a variable paper clamp to help ensure cutting precision and cutting guides for various sizes of paper, photos or angle cuts and offers a metallic cutting bed surface for enhanced durability. Includes 4 types of blades: straight, perforated, wavy and fold. Base with unique integrated SafeCut cartridge storage compartment. Metallic cutting bed cover for enhanced durability. Welcome to MyBinding.com. 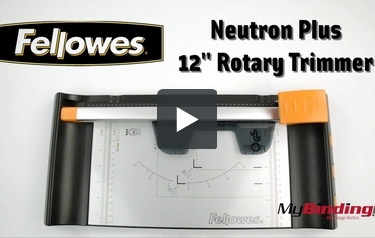 This is the Neutron Plus 12” Rotary Paper Trimmer from Fellowes.This excellent rotary trimmer is designed for personal and home use, with the ability to slice through up to 10 pages of 20 pound paper with ease. The Neutron Plus offers 4 different blade styles to utilize, whereas the regular Neutron only offers one. Fellowes’ patented SafeCut blade cartridge system makes switching out blades as easy as loading the paper. Just lift up the plastic cover on the blade carriage and pull the cartridge out. Blades are only exposed when you depress the carriage cover, so you never have to worry about getting cut. The four included blade styles are regular straight cut, straight score, wave cut, and perforating cut. This super lightweight trimmer is easy to store, simple to use, and always perfectly safe. For more videos and all your binding needs, go to MyBinding.com. Getting a perfectly straight cut is hard to do with scissors, which is why there are rotary paper trimmers. If you need a device with which to perfectly trim your documents, you should check out the Fellowes Neutron Plus. Here's what you need to know about it, including what kind of grade it gets. Rotary trimmers are good if you just need to cut a few sheets of paper at a time. The Neutron Plus has a 10-page cutting capacity which is pretty typical for this kind of device. Ten sheets isn't a lot, so if you need to cut more at once, you might want to look into getting a guillotine cutter. The Neutron Plus has a cutting length of 12 inches. You'll be able to easily trim letter-sized documents (8.5" x 11") as well as smaller items. However, you'll need a different trimmer if you need to work with paper that's longer than 12". Safety is really important when using a rotary trimmer. Luckily, this cutter is pretty safe to use because it uses Fellowes' trademarked SafeCut blade cartridges. The blades are encased in plastic so you won't run the risk of injuring yourself. Speaking of blades, there are 4 different kinds you can use with this trimmer: straight, scoring, wavy, and perforating. That makes this device perfect for crafting as well as typical office work. The blades are easy to change and since they're of the SafeCut variety, you won't get cut when doing so. Plus, there are storage compartments for the different blades in the base of this trimmer so they'll always be handy. The Neutron Plus has a metallic base that's pretty durable so you'll be able to use this trimmer for a long time. There are cutting guides printed on it so it will be easy to trim paper and photographs. A protractor is even present, so you can make angled cuts if your project calls for them. To keep your materials in place, this cutter has a paper clamp that can be adjusted depending on the size of your documents. This feature really makes this product user-friendly. This trimmer really isn't too big so you should be able to find room for it even if your workspace isn't large. The dimensions of this device are approximately 3" (height) x 8.5" (weight) x 19" (depth) and it only weighs 3 pounds. It will be easy to transport if you ever need to. The Neutron Plus isn't expensive at all. In fact, it will cost you less than $50.00. Plus, it comes with a 2-year warranty just in case you need to get it fixed. Final grade: A-. The Fellowes Neutron Plus is a pretty good rotary trimmer. It's great that it can utilize different blades and that every one of them is safe to use. (And that there's storage room for each type of blade.) Although it can't cut really long paper, this trimmer is nonetheless a good choice, especially for crafters and other creative types. And it's even affordable. So if you need a rotary trimmer, be sure to consider the Neutron Plus. Do you have replacement blades for the Neutron Plus trimmer? Thank you for your question. You can find the replacement blades for the Fellowes Neutron Plus Rotary Paper Trimmers here . Thank you for your question. We have replacement cutting sticks available for the Fellowes Neutron Plus 12 Inch Rotary Paper Trimmer. You can find them here .